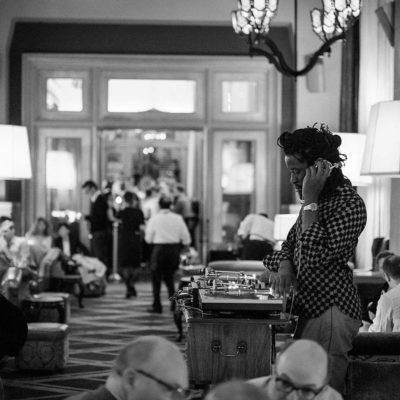 Join us and our resident DJ Aku for a night of great music and craft cocktails. Aku Orraca-Tetteh started playing the classical piano at the age of 5. He then went on to study at the Cleveland Institute of Music, and later studied the concept of "auto-physio-psychic" music with legend Yusef Lateef at Amherst College. With his twin brother, he formed the band Dragons of Zynth that was picked up by the ubiquitous producer, Dave Sitek (yeah yeah yeahs, TVOTR, Scarlett Johannsen. He's since collaborated with the likes of Massive Attack, TV on the radio, Maximum Balloon (see Daisy Lowe's Esquire "women we love" shoot, and Saul Williams. In 2011, Santigold invited Aku to join her band as a bass/keys/Dj (when needed) opening up for the Red hot Chilli Peppers. Solange Knowles and Saul Williams soon followed suit adding him as well. A new album is underway in 2016 along with some films credits (played opposite Jena Malone in Richard Gere's Time out of Mind.../ Peter Tosh in Scorsese and jagger's VINYL) and songs on the soundtrack. Becoming a Dj was an obvious choice for Aku. You can see him playing at Soho grand, Neuhouse, Never never, pioneer works or private events (Basel, movie premieres) He is a music curator who only plays off the vibe of the room and lives to see how people are affected by sound.